Under Admin > Equipment & Spaces > Manage Locations, click the Add New Location. Give the location a name. Once you save your new location, you'll be taken to the Edit Location page where you can customize the location's settings. Location Name: Need to make an adjustment to the location name? Make changes here. Access: Set this location to public (freely available, shown in all menus / lists) or private (hidden from the public and menus / lists, accessible only by those who know the URL). Friendly URL: You can more easily link to your location's public booking page by using a Friendly URL. Although optional, it can be especially helpful for private locations. Terms & Conditions: Use the rich text editor to communicate this location's terms and conditions. Remember, this will apply to all categories and items loaned from this location. Enable LibAuth Authentication: Enable an external authentication method (Shibboleth, CAS, SIP2, etc) using LibAuth. LibAuth authentication methods are set up by LibApps Admins. 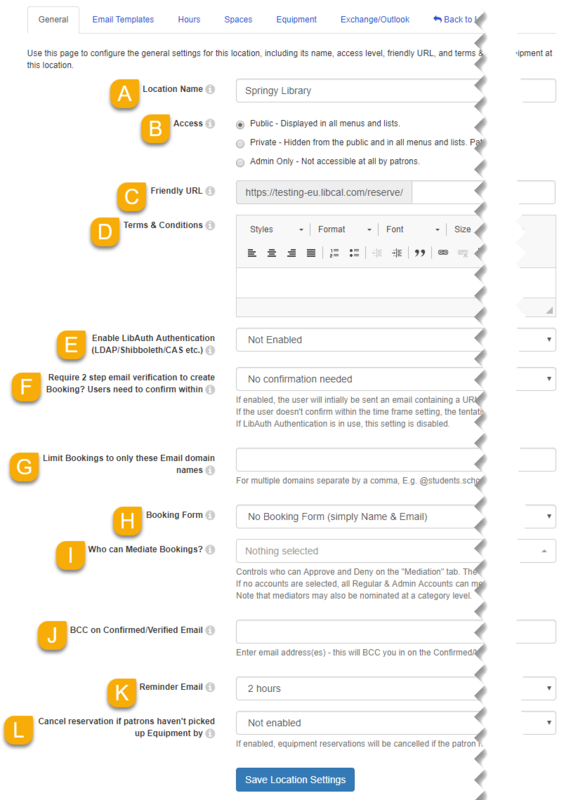 Require 2 Step Email Verification: Optionally, require users to confirm their bookings within a certain period of time via a confirmation email. Select the time in which they must confirm bookings. This can help weed out users who try to take advantage of the booking system. Limit Bookings to Only These Email Domain Names: Optionally, restrict bookings to users with a specific email address domain. Booking Form: Select the Booking Form that should be used by this location. Select Name & Email only, or use a custom booking form. Who Can Mediate Bookings? : When a room category has room mediation enabled, select which users are allowed to approve or deny booking requests for those spaces. The users you select here will receive email notifications when bookings are pending approval. If this is left empty, then any regular or admin user can mediate room bookings for this location. No users will receive email notifications when bookings are pending approval. BCC on Confirmed/Verified Email: If you'd like to BCC specific email addresses on all booking confirmation or verification emails, enter those addresses here. Separate multiple addresses with a comma. Reminder Email: you can choose to send a reminder email to patrons prior to every booking in the location (spaces and equipment), with options ranging from 2 hours to 48 hours before a booking's start time. Select "No Reminder Email" if you do not want to send these notifications (this option cannot be customized by category or space/item). ​Cancel reservation if patrons haven't picked up Equipment by: To enable, choose how long a patron has to pick up their equipment after their booking's starting time. Once that window of time passes, the booking is automatically cancelled, making it available to other patrons. If this setting is not enabled, then bookings will not expire until the ending time has passed. Remember to click the Save Location Settings button at the bottom of the page to save your changes. Click on the link in the Manage Hours column to set or view the location's hours. 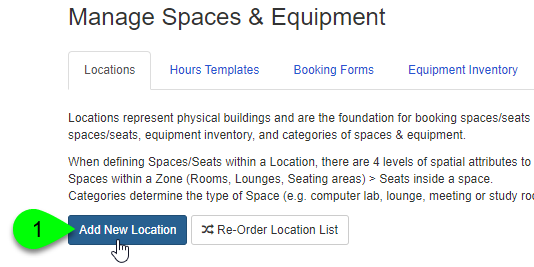 Click on the link in the Spaces column to manage the location's spaces. Click on the link in the Equipment column to manage the location's equipment. Click on the Edit () icon in the Action column to edit a location's settings. Click on the Delete () icon in the Action column to delete a location. NOTE: this will delete all categories, items, bookings, and stats for this location. Click on the Public View Spaces () icon in the Action column to preview the public space booking page for this location. Click on the Public View Equipment () icon in the Action column to preview the public equipment catalog for this location.